Two pink vireo eggs on top of three brown speckled cowbird eggs. Sitting seemingly innocent in a nest created by a hard-working mom-not their mom- there are three brown speckled eggs, unaware so far of their role as impostors and strangers in a home that is not theirs. While, two tiny pink eggs sit unaware of their oncoming struggles against the injustice of parasitizing siblings or their impending abandonment. Yes, perhaps the mom of the tiny pinks, a Bell’s Vireo (Vireo bellii), in an anxious frenzy, has already left the tiny pinks all alone to compete with the three unplanned brown speckleds without her help. (I’m not sure if the nest is a Bell’s Vireo’s nest, although it does seem to be made by some kind of vireo at least). If the Bell’s Vireo has decided to stay, then she will have a hellish time raising five children, three of which are not even her own. The brown speckled eggs are (maybe) the eggs of a Brown-headed Cowbird (Molothrus), an infamous invader with the ability to loot by giving their children to others. Cowbirds are friends with cows (hence, the name). The cowbirds prance up and down gobbling up the stream of insects that the cows stir up as they walk through the pasture. Cowbirds watch empty nests, In this instance, there was a cowbird eyeing a Bell’s Vireo’s meticulously built nest. Plotting its espionage, it bided its time until the Bell’s Vireo left. Then it planted its larger eggs in the nest and left its offspring to the flip-of-a-coin (with the chances bent towards abandonment) of a Bell’s Vireo mother. Though sometimes, the Cowbird mother will return to see how her eggs are faring in their foster home. Sometimes on its return visit, if its young has already hatched, it may push out the other eggs of the nest leaving a bereaved Bell’s Vireo mother with no young except those that are not her own. Although Cowbirds may not be the best bird mothers, they are incredibly fecund. They are occasionally able to produce thirty-six eggs during one summer mating season, so they can afford to take a gamble and put their eggs where (according to their unwilling hosts) they do not belong in the hope that the host of the nest will take care of their eggs instead of them. One may be tempted to call them lazy mothers, but it is actually that they invest a lot of energy in reproduction. Cowbirds are so much of a threat to the host of the nest that they parasitize that they are cited as one reason why the Black-caped Vireo is now listed as endangered. 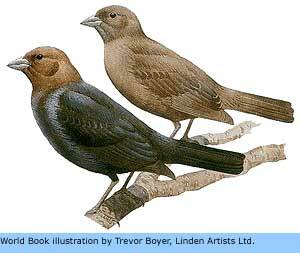 Individual cowbirds can even act as specialized nest infiltrators, targeting the nests of a specific species of birds. This Cowbird could have been targeting Vireo nests. If the young cowbird eggs pictured do hatch, then the Cowbird hatchlings will quickly learn the pesky ways of their biological parents. They will hatch fast, complain for food, grow fast, and bully and steal attention from the Vireo hatchlings sometimes even killing their foster brothers and sisters. 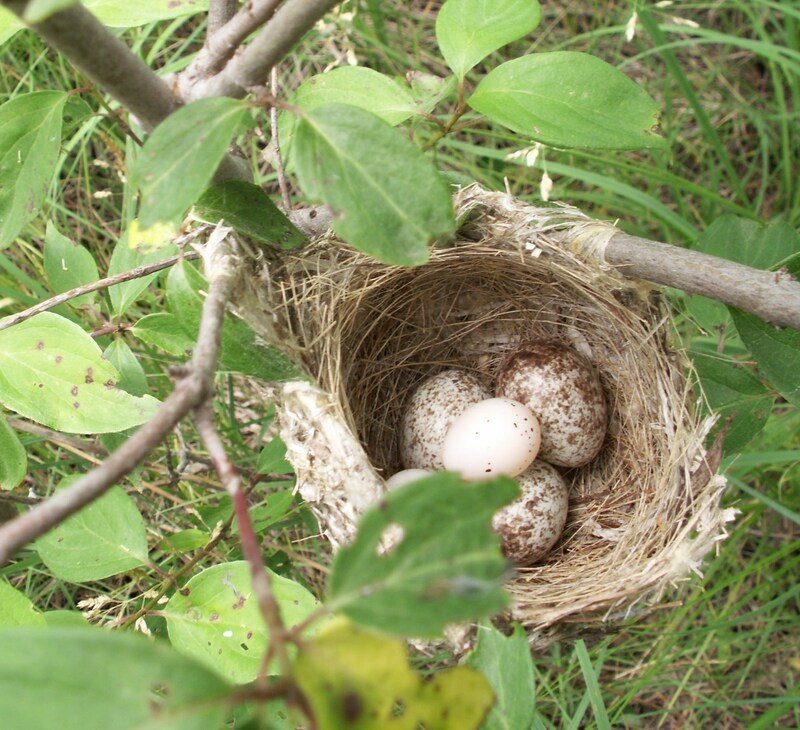 However, the host of the parasitic eggs, Bell’s Vireos or over 219 other host species, do not sit back passively when Cowbirds invade. If they catch the female Cowbirds laying the eggs, the female and male Vireos will sometimes attack. They often retaliate by building a nest on top of the Cowbird eggs or poking them or moving them out of the nest. Tactics of fighting back against cowbirds differ depending on the size of the victim. Still Cowbirds remain relatively successful in their sneaky egg-laying way. In sum, it would be tough to be a bird with the eggs of impostors in your nest. Bryan L Sharp and Barbara E. Kus, 2004. “Sunrise Nest Attendance and Aggression by Least Bell’s Vireos Fail to Deter Cowbird Parasitism”. Wilson Bulletin, 116(1) pp. 17-22. I’m trying to identify a skipper found in Manhattan, Kansas. Problem is that online there is conflicting images saying that this little guy is either this butterfly or that. Anyways, what I do know is skippers are tiny, pretty but nearly unnoticeable bugs. 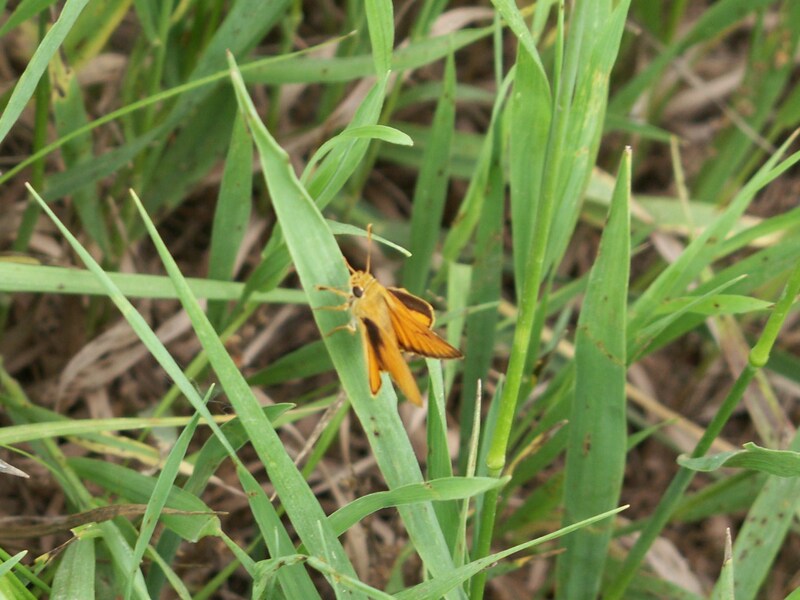 Many skippers feed on grasses as larvae and nectar as adults. They are very prevalent on the prairies and have a very funnily bouncy way of flying. Many skippers, especially this skipper, remind me of tabby cats. They are big-eyed, furry, and like to bask in the sun. After spending nearly 2 hours on identifying this little guy and having encountered this issue countless time before, I’ve come to a conclusion that there needs to be more development of online resources for insect ID. Hmmm….perhaps I will make online insect ID development a project of mine further down the road, but in the mean time it seems that I have to buy more insect ID books and communicate with others interested in insect ID. What do you think this insect is? Have you ever seen this one? I have limited it down to probably being either a Delaware Skipper (Anatrytone logan) or a Byssus Skipper (Problema byssus) and I am leaning towards calling it a Delaware Skipper. Both are commonly found in prairies, which is where I found this skipper. The black bar at the end of the forewing seems to match more with the Delaware Skipper. The images of Byssus Skippers range from being mostly black in color (like the Wikipedia page written on Byssus Skippers) to more bright and orange in color (like the skipper featured in my photo). Also, I found it in Kansas and the Byssus seems to be more prevalent in Kansas so that confuses matters. Through looking at discussions and Google images it seems that others have expressed this confusion as well.